Use LEDs and a Microcontroller to Make an Altered Carbon Cortical Stack « Adafruit Industries – Makers, hackers, artists, designers and engineers! It has been scaled based on a screen shot from the show where they are in a cigarette ash tray. I’ve got them at just under 45mm wide and about 15mm tall. The one in the gif was done in Sterling Silver. It contains a small lipo pouch cell, an ATTiny microcontroller, some 1206 SMD LEDs, and a magnetic reed switch. 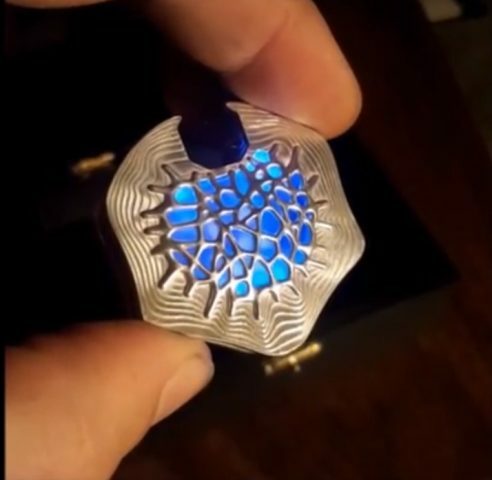 Visit Imgur to see how the light pulsates. Read more in this build thread.